It was only a matter of time before I started Snyder’s Power series, because I’m such a big fan of her other series. So, here’s the thing: I liked it, but not as much as I liked her other series. There’s something interesting about a plague that led to healers being hunted. And all of the lilies! I liked how they were introduced and what they do and even some of the studies done on them. The history of the plague and everything that unfolded after it started popping up was really interesting and one of my favorite parts of the book. I also liked the boarding school for nobles, and the histories between all of them. Oh, and how magic worked in this world! I really liked all of the different abilities the magicians had. There are so many different kinds of magic, and it’s really cool that there’s such a range in magical abilities. The characters were fine, but I didn’t feel as connected to them the way I feel connected to the characters in her other series. And while I liked this world, I also wasn’t as pulled into this world as I was with her series. 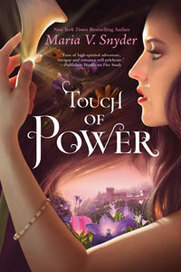 I liked Touch Of Power and the different kinds of magic we see in the book. I also liked the plague and it’s history (and consequences). It’s definitely my least favorite book of Snyder’s, but I still am curious about what will happen next. Touch Of Power gets 3 stars. I was really interested to read your review as I’ve actually just ordered this book! I don’t know much about this author but sounds like it’s worth checking out her other series? *buts in* Snyder is seriously amazing! 😀 The Study series is my favourite, followed closely by this one. I hope you like it! Glad to hear it’s good and I can’t wait to get stuck in! 🙂 I’ll really need to try the Study series as well! I really love her Study series and her Glass series! I think I went in with really high expectations because of that, but I still liked Touch Of Power. I’ll need to give all her series a try I think! I think there was something missing from this book, when comparing it to the Study series. I still rated it five stars, though. I absolutely loved the new world, and the different types of magic. I thought Avry was such an awesome heroine, and I was kind of in love with Kerrick. I agree that there’s something missing. I’m definitely planning on continuing the series!